Apologies for my absence of late bloggers, sometimes life just gets in the way I guess. 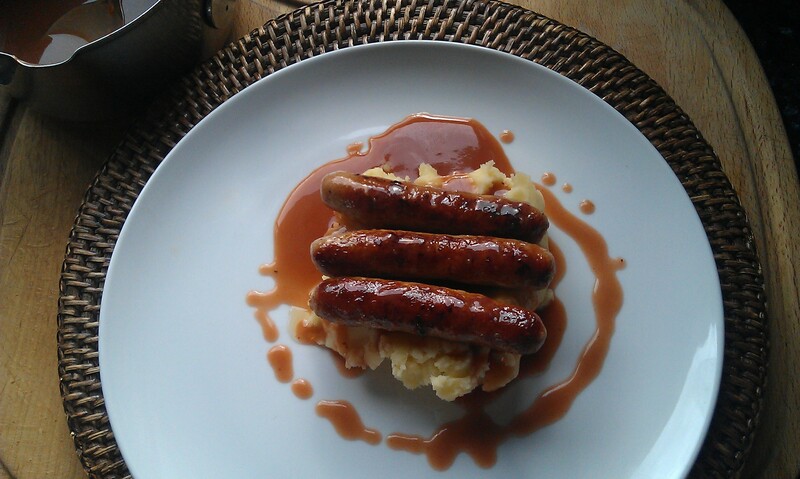 This is my ‘posh’ version of bangers and mash. The ‘jus’ used in this recipe is incredibly versatile and can be used with lamb and beef also. I usually make my jus first as I like to allow it to reduce on the stove while I cook everything else. Chop the onion and garlic roughly. Fry in a little olive oil until soft, together with the thyme. When soft add the tomato puree and flour and mix until cooked out. Add the port gradually and mix until you’ve formed a smooth paste. Add the stock and allow to simmer. Leave this to reduce for approx 20 mins. While the sausage and potato cook. Steam your potatoes, I used ‘rooster’ but any floury potato will do. Meanwhile heat a little olive oil in a griddle pan and fry your sausages. Try to get really good quality sausages from your butcher – with at least 70% pork quantity. Fry the sausages until cooked. Meanwhile mash the potato together with some butter 15 g and a little warm milk. I usually whisk my potatoes after mashing to achieve a really light fluffy consistency – yum! Sieve the jus and pop back into the saucepan. I usually place the potato underneath the sausages to catch all the yummy gravy – delish!